“…une vièle Sarangi, venant du Santal, nom en soi, évocateur. Sa présence et sa personnalité nous interpellent. Ce petit chef-d’oeuvre de sculpture attire notre regard au fond du sien. C’est bien ici l’exemple d’un objet d’artisanat, échappant à son usage pour accéder à l’intemporel”. Perché ci circondiamo di bellezza? E perché questo circondarci non ci ha mai appagato, noi uomini, di ogni dove e di ogni tempo? Per una semplice ed insieme cogente motivazione: perché ne abbiamo bisogno! Guardo questo oggetto che cari amici hanno avuto l’ardire di porre sotto i miei occhi; l’ardire, perché conoscono la mia limitata cultura ed il mio sconfinato amore per le produzioni artistiche di un altro continente. Ma la loro è una sfida vinta in partenza: questa straordinaria creazione, l’immagine di questa fanciulla dai seni puntuti e da un’ incredibile quanto armoniosa corolla, mi ha conquistato al primo sguardo. Non ha importanza cosa sia. Io ne ammiro le purissime forme, ancestrali, evocative, ardite e stupefacenti: ed i miei sensi sono appagati da quella Dea misteriosa e sublime….avita e sconosciuta: la dea della Bellezza che in ogni cultura ha ricevuto nomi diversi, ma dovunque ha lascito profondissima traccia di sé, col suo passo lieve ed incorporeo. I santal scolpirono i loro liuti antropomorfi, i Dhodro Banam, spesso nella forma di una donna, trasfigurando le risonance dell’istrumento nelle rotondità plastiche conosciute nella scultura Hindu reinterpretate al livello tribale attraverso la simplificazione e distorsione domandata e dettata dalla particolare forma dello strumento. L’interpretazone che segue dello strumento effettuata da Stella Kramrisch è una delle più acute espresse in queto campo, e allo stesso tempo poetica. Through its thin lipped mouth a god may speak. Il banam è considerato infatti un tramite tra l’umano ed il divino. Il suono dello strumento quasi emanazione del volto femminile diviene profetica voce. link auditory and visual experience in one manifestation of the numinous. Strumento inteso come medium punto di contatto tra il visbile e l’invisibile. The Santals believe in the magical powers of this musical instrument, a medium between the human beings and the supernatural. Anatomia umana e iconografia del Banam. resume in its various parts the anatomy of an human being: head, ears, neck, chest and stomach. The string is the most important part of the instrument, because it unites the other parts of the liute together, it’s considered as the breadth of the Banam. The Head (Bonok) of the instrument represents the Space. eck (hatok) and chest (koram) are directly connected with the Respiration and represents the equivalent natural element of the Air. The stomach (lac) represents the fire. The ears (lutur) the ether. The term banam means body and represents the earth. Mito orale che ci racconta della mitologica origine del Dhodro Banam. Once upon a time lived an old couple. They had seven sons and a daughter who was the youngest of all. The sons used to go hunting and the sister cooked meals for them. Some time later the couple died. All their sons and daughter came to a forest to live in the same way as they used to live earlier, the sister cooked the meals and looked after the house while the seven brothers went hunting. One day while their sister was cutting sin arak (leaf-vegetable), one of her fingers got cut, and the blood of the wound got mixed with the vegetable. She cooked it and served it to her brothers after their return. They found the vegetable delicious. So they asked their sister how the vegetable became so tasty, and found that her blood had got mixed with it. The eldest brother wondered that if her blood could make the food so delicious, how tasty would her flesh be. So he decided to kill her and share her flesh with his brothers. Her body was then cut in seven pieces and each brother received a piece. Except the youngest brother, the other ate the sister’s flesh, he went to a pond sadly with his share, the fish, the crab and all the other creatures of the place, seeing this asked him the reason of his sorrow. The youngest brother narrated them the whole story, after that the creatures of the pond suggested him not to eat the flesh of his sister and instead to put it inside the mound of white ants. Some year later, in the place grew a huge guloic tree. It started to grow beautifull flowers and a melodious sound was heard from the tree. A jugi who often used to come to the tree for picking up flowers heard this melodious sound and remained astonished. Dancers, dressed with a Sari, analogous subject we can find in old photos of Elwin Verrier and in the iconography of some carved panels of the wedding palkee of the Santal Parganas tribe as well as of the Banam. Ancora Stella Kramrisch caratterizza la plastica iconografia di questi pannelli istoriati dei Santal, parte delle lettighe matrimoniali tipiche dell’etnia Parganas. Il parallelo con i rilievi egiziani è molto sugestivo. The narrative typical carving of the panels, in low profile, it is characterized by human figures in combined front profile view, limbs at times overlapped in telling gestures and lively actions of spontaneously formed group, and are based roughly on one groundline in common, in a cursive notation of figures, human and animal, more valuable and surely less expert, but according to Stella Kramrisch somehow paralleling Egyptian reliefs. Seguono informazioni circa la lettiga matrimoniale e della loro iconografia. and was made by tribal craftsmen themselves. The RAHI was created with a certain amount of ceremony. when it was completed the couple sat on it and were carried to the central Manjhithan where more pigeons or a goat were offered. The main subjects carved on the Rahi’s panels are derived from the local ceremonies, such as marriages, the Miths of the Santal creation, the totems devoted to the twelve Santal clans, the Santal Hul or Santali rebellion of 1855, and especially the everyday life scenes. A part of these themes it’s common with the carved top of the Banam. Sometimes musicians and dancers are accompanied also by acrobatic perfomers. Questo pannello eccezzionale nella resa iconografica ci presenta una sorta di fusione iconografica tra elementi sacri a destra e profani a sinistra. Caratteristica tipica della libera inventiva di queste popolazioni, comune anche alla plastica ‘reinventata’ di tutta l’arte popolare della regione himalayana. Un altro strumento musicale della tradizione dei Santal è il flauto traverso, ne presentiamo qui alcuni molto interessanti con estremità in bronzo fuse a cera persa. held an important role in the music tradition of the Santal people. Two flutes of this particulary rich tipology are present also in the collection of the Musee de la Castre of Cannes. The Jadu Patuas are painters and story tellers and go from village to village carrying their painted scrolls made of paper sheets sewn together with a bamboo stick on each extremity. The themes they represent on the scrolls are about a dozen . However, there is different interpretation for each theme. A Jadu Patua can, looking at one scroll, say different stories depending if his audience is Hindu, Muslim or Santal. This last ethnic group is the most important audience for the Jadu Patuas. The Patuas live with the money that the villagers give them after listening to their stories. The fact that they are magicians give a special effect to their intervention because the villagers fear them.
. 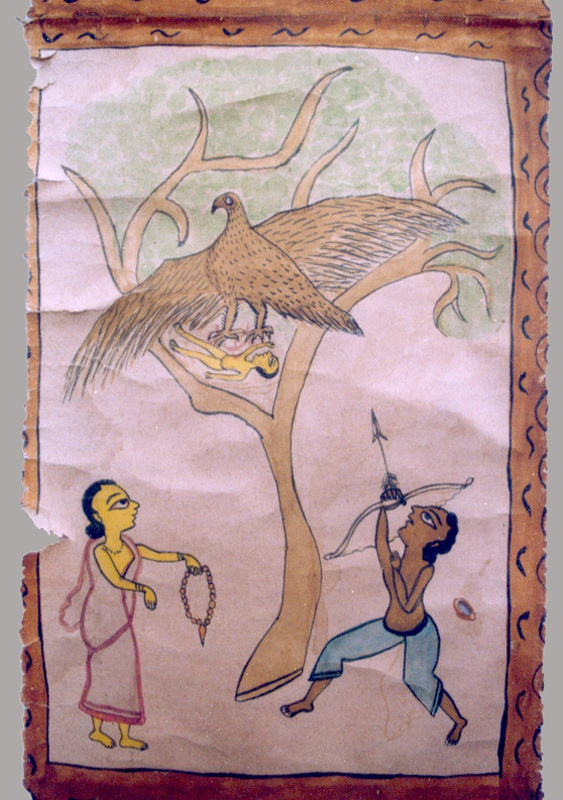 When somebody dies in a village near the Jadu Patua’s one, the “artist magician” visits the family of the dead with a small and simple image (about 3 x 2 inches) which is supposed to represent the dead in a simple way. Only the late person’s pupil is missing. Showing this image to the family, the Jadu Patua tells the story evoking the suffering of the dead whose soul is still trapped in hell. The family then gives an offering to the Jadu Patua in order for him to intervene. The ritual for the Magician painter consists then to paint the dead’s pupil in order to free his soul. and a lot of scrolls about Yama the god of hell (showing all the ill treatments, sometimes sexual, given by Yama and his servants to the dead who behaved badly during their lifetime). It seems that the scarier the Jadu Patuas’style gets, the more highly he is regarded. Perché ci circondiamo di bellezza? E perché questo circondarci non ci ha mai appagato, noi uomini, di ogni dove e di ogni tempo? Per una semplice ed insieme cogente motivazione: perché ne abbiamo bisogno! a medium between the human beings and the supernatural. head, ears, neck, chest and stomach. Neck (hatok) and chest (koram) are directly connected with the Respiration and represents the equivalent natural element of the Air. Another quite common iconography that we can find on the Rahi Panels is linked with the presence of elephants, horses and horsemen. Sometimes these representations are linked with the marriage procession. the back carved top of a banam lute. of this particulary rich tipology are present also in the collection of the Musee de la Castre of Cannes. 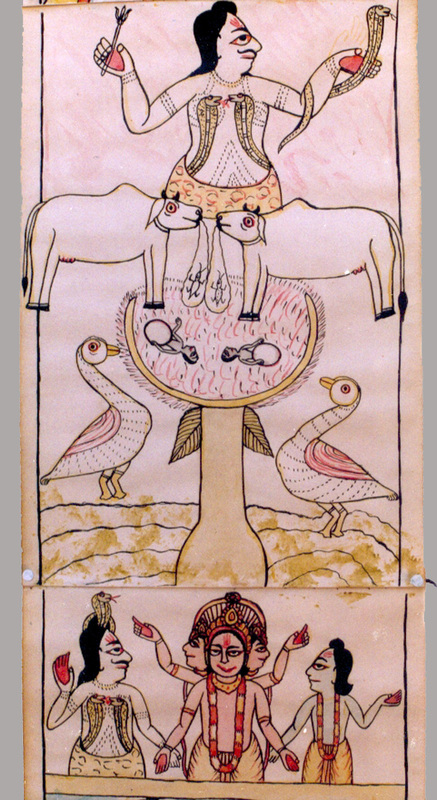 the god of hell (showing all the ill treatments, sometimes sexual, given by Yama and his servants to the dead who behaved badly during their lifetime). Eastern outskirts of the Chutia Nagpore plateau. agriculturists. Other representatives of the race are the Mundas and Hos. the village priest, the GODET was the village constable. Over a group of villages was the PARGANA or tribal chief. generally terminate in dances, and the drinking of rice beer. had risen in rebellion in 1856.
the Scandinavian Mission to the Santals. in the first years of the 1900’s living at Mohulpahari in the Santal Parganas. sit up all night telling stories. the knowledge of these stories was tending to die out. relating to the dealings of bojigas and men. Text by Ethnoflorence photo and pieces from Ethnoflorence Indian and Himalayan Folk and Tribal Art, Art Premiers Art Primitive Collection Bruxelles. Links from Ethnoflorence Indian and Himalayan Folk and Tribal Art, Art Premiers Art Primitive Collection Bruxelles, Hervé Pedriolle Collection, IGCNA Org, Tribal Art the World of Tribal Art magazine (for the details please scroll dawn). In assenza di cataloghi, provenienze, studi etnografici, esibizioni temporanee o permanenti, parlare dell’arte dei Santal people del Bihar, Orissa, West Bengala, è qualcosa di estremamente arduo. In un ‘epoca in cui anche le arti premiers si sono asservite alle logiche del mercato globale, una piccola produzione artistica di questo tipo sembra non avere spazio; perché pubblicare un catalogo o finanziare una mostra quando poi il Mercato non se ne può avvantaggiare? E’ una questione di numeri… che hanno il colore dei soldi. Meglio continuare a pubblicizzare sempre le stesse collezioni Major di Arts Premiers, il ritorno in termini di Pubblicazione/Provenienza assicurerà un certo e già calcolato appeal da esibire in Aste e Gallerie perpetuando così un Mercato sempre più alla ricerca di chimere e certezze…e nel frattempo infestato da cinquanta anni da migliaia di oggetti 100% fake. Allorché furono intrapresi i primi studi sul terreno l’antica tradizione culturale dei Santal era già entrata in una fase di rapido e repentino declino. E come meravigliarsi di questa definizione, i liuti monocorde dei Santal , dhodro banam, sono robuste sculture antropomorfe , intagliate nel legno gaulico , connotate da sontuose patine color mogano, considerate dai loro stessi artefici alla stregua di esseri viventi, latori di poteri magici, strumenti mediatici che connettono il mondo visibile con il soprannaturale. La storia dell’ origine dei Banam (che tradotto significa corpo) affonda le sue radici in un arcaico passato fatto di incorrotte tradizioni orali perpetuate di generazione in generazione. Un’origine che affonda la sua nascita nella mitologia dei Santal People. Nel sacrificio di una giovane sorella, nella compassione di un giovane fratello, nella metamorfosi mistica dei resti della prima in un albero di gaulic … da un ramo del quale nascerà il primo mitico Banam. Uno strumento che riproduce un suono simile a quello degli esseri umani. Quasi una funzione oracolare quella che ci suggerisce il testo, latrice di profezie e divinazioni propiziatorie, utili in un contesto rurale dominato da clans patriarcali nei quali l’elemento musicale svolge un importante ruolo non soltanto culturale ma anche rituale, connesso con la fertilità delle messi, intercalato da danze da tenersi prima e dopo la stagione delle pioggie e tra la semina ed il raccolto. Danze rituali nelle quali donne abbigliate in Sari sono accompagnate da gruppi di musicisti. Da un punto di vista iconografico i suddetti gruppi di danzatrici si ritrovano rappresentati sia nei carved tops dei Santal Banam che intagliate ad altorilievo nei pannelli delle loro lettighe nuziali. Anche la celebrazione del matrimonio è pervaso da precise ritualità e importanti funzioni sociali, non ultima quella di legare tra loro i vari clans patriarcali. Circa la funzione rituale della lettiga nuziale Ms Stella Kramrisch ricorda come “…when a Santal crafsman begins his work on the litter, a pair of pigeons is sacrificed … when the litter is completed and its owener taken possession two more pigeons are part of anoher sacrifice, … the activity of carving is part of the marriage rite, as it the procession of the marriage litter…”. Lo stile iconografico di questi pannelli è connotato da un estrema, solenne e monumentale definizione stilistica delle figure, scolpite sia frontalmente che di profilo, parafrasando Ms Stella Kramrisch “…somehow paralleling Egyptian reliefs…”. Tra i temi ‘trattati’ in questi pannelli istoriati, oltre alle già succitate danze rituali propiziatorie, si annoverano le fasi del matrimonio stesso, cerimonie locali, scene di vita quotidiana, i miti di creazione dei Santal e dei relativi 12 Clans, scene di guerra celebrative della ribellione del 1855 (Santal Hul). Sul mercato di Katmandu sono apparse ormai da anni ‘povere’ imitazioni dei pannelli originali, scolpite su vecchie assi si connotano per un stile approssimativo e la totale assenza di patina. Over 2000 exclusive objects from Oceania, Africa, Indonesia, China, Japan, Tibet and Laos, will come together at what is TAF Amsterdam 2009. The exhibition comprises jewellery and sculptures, but also textiles, masks, implements and furniture. Special pieces from far-away countries. In the last weekend of October they are to be seen and purchased in Amsterdam, at the seventh edition of TAF Amsterdam.